$10 off Unshelved Library and Ultimate Unshelved book bundles, and $5 off the Unshelved Starter Set, making this the lowest price at which we've ever sold our books! 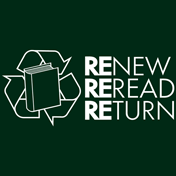 $5 off selected t-shirts: Renew, Reread, Return, I Read NY, Large Print. And of course the Buddy shirt already starts at just $14.95! If you're shipping outside the U.S. you've got just a few days left - we recommend ordering by December 1. Inside the U.S. you've got until the 15th, but sooner is better!